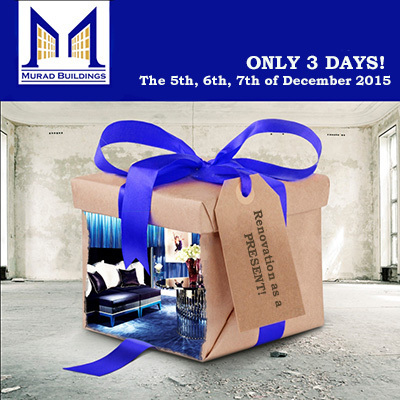 Murad Buildings | Promotions and discounts | Action Devoted to Murad Buildings' Birthday! Action Devoted to Murad Buildings' Birthday! A lot of people want to buy and settle immediately in an apartment in a new and beautiful house. However, not everyone would like to deal with repairs. Not everyone has the experience or time to do so. Well, if you buy an apartment with repairs, it usually costs almost twice as much. In honor of our birthday, we decided to arrange a surprise for customers and announce a gift as a free repair in a new residential complex "Kukcha Kurgoni". The house was built this year, several apartments are already occupied, and the other is being renovated. We have selected several apartments and made repairs already. Now, we plan to give them to those who have time to buy them first. Only for three days - 5,6 and 7 December - you will have the unique opportunity to purchase an apartment with repair on the price of the apartment without repair! These days in the residential complex "Kukcha Kurgoni" announces an open day! All three days company's management will hold a fascinating tour of the facility for each visitor! In addition to a gift in the form of free repair, we plan to allocate part of the funds received from the sale of these flats to build playgrounds in other areas of the city Tashkent.